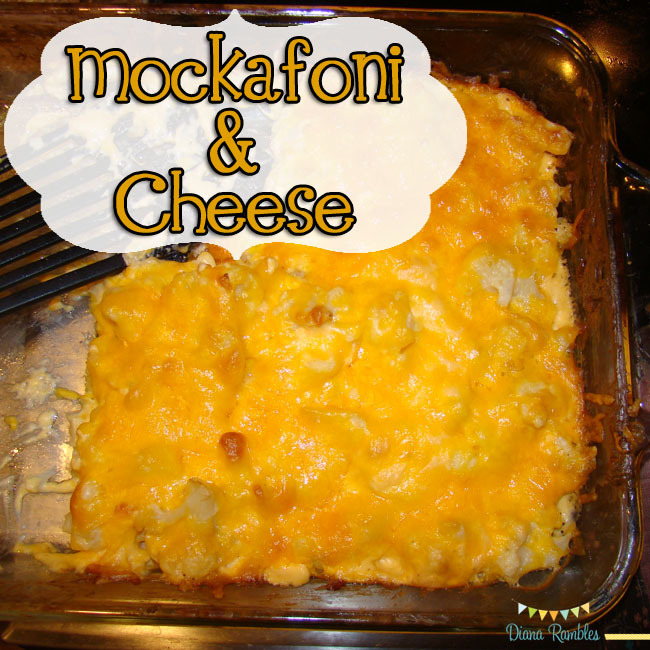 Check out this tasty low carb alternative to traditional mac and cheese called Mockafoni. For the last several years I have tried to to eat less carbs. I’m able to control my weight and therefore my health with a lower carbohydrate diet. Here is one of our favorite recipes that I found at Linda’s Low Carb Recipe site. I serve this as a main dish, so I double Linda’s recipe with a few tweaks. 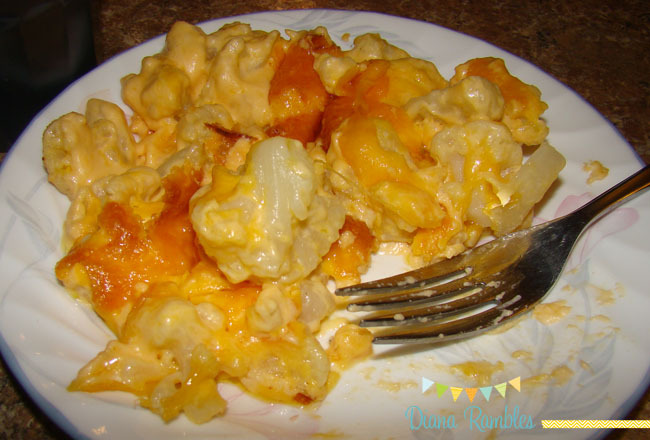 This recipe uses fresh or frozen cauliflower, heavy cream, cream cheese and cheddar cheese. While I show mild cheddar cheese in the photo, I prefer to use sharp cheddar cheese in casseroles. They just have a bolder taste. This recipe is prepped in the microwave and then baked in the oven. The prep is not too difficult at all. We’ve taken it to potlucks and it disappears, even when people know it’s cauliflower and not macaroni. Kids like it too! Cook the cauliflower until tender and then drain it. In a 9×13 casserole dish; soften the cream cheese in the microwave for 90 seconds on HIGH. Whisk in the heavy cream until smooth, then stir in about 2 cups of the cheddar cheese. Microwave on MEDIUM about 3-4 minutes or until the cheese is melted. Top with the remaining cheese and bake at 350º for 35 minutes, until bubbly and brown on top. Let it stand for about 10 minutes before serving. With all that cream and cheese, I can't imagine anyone NOT liking that! Looks delicious! Yummm! I just pinned this too! Sounds delicious! I'm a new follower of you on FB, here and PInterest! :) Have a great night! Thanks Chrissy! I am following you too! Hi Diana, thank you for your follow on both my Blog and Pinterest. Looking forward to doing the same for you! Love us Cauliflower and cheese at our house too. Oh yum that does sound good!! Hi Diana I make something similar however with mushrooms in it; I do love me those mushrooms too. Yes, I've made many recipes from her site! This looks sooo good! It would be a great substitute to the homemade mac n cheese I make every week. And a lot healthier too! I'm pinning this one. Hopefully the family eats it all up!! Check out the superhero canvas and hair clip holder I made this week!!! couliflower...super sneaky. i love the creative name you gave it! I didn't create the name, but I do love it! Really! I've never made anything like that before,I must say I'm very interested - it looks so yummy! Sold! I'll try it tomorrow after I go grocery chopping for cauliflower! It's good with fresh cauliflower too! Thanks Robin! I will come party with you! Thanks for linking up at Show Me Your Plaid Monday's! Oh I love this! Low Carb is what we all need right now! I lost 30# a few years ago from low carb. I've been lazy over the holidays and put on weight, but it's time to get back to low carb! We love califlower - I am so trying this out this weekend - YUM! I love how versatile cauliflower is! This looks delicious and I pinned it. This sounds so good! Do you think it's "freezer friendly"? I've been trying to stock up on freezer meals so that when the baby is born, we won't have to worry about what's for dinner! I have NO idea! We scarf it all down so quickly that I don't even know how it is reheated. If other cauliflower casseroles are OK frozen then this may be. Looks yummy! Also, it's gluten free! Didn't even think about GF!! Awesome! Looks great! I love the homemade kind! yummo. This sounds great!!!!! Thanks for sharing. This looks so good I love cauliflower if only I could get the boys here to like it. Great recipe my dear! We will just love your Mockafoni and Cheese, it looks awesome! Thank you so much for celebrating TWO YEARS with FULL PLATE THURSDAY, I appreciate your visit! I liked your name for the recipe! I love how you are sneaking cauliflower in here. I think my hubby would love this! I love cauliflower and this looks delicious! I love anything cheesy! This looks great! I bet that is so good! My kids would so eat their veggies! Thanks for sharing. I appreciate every comment here. I am shocked at how much attention this recipe has gotten. It's sooo yummy! Yum! This looks like a delicious alternative to the real thing :) I'm going to have to try this! Wow, I'll totally have to try this. I just realized, I've never even given my girls cauliflower. lol! :) Thanks for sharing! The name of the recipe woke my interest. And now looking at the ingredients, I love this dish! Perfect way to get rid of the carbs. I gotta try this recipe Diana!! Looks absolutely delicious! Love how easy and accessible the recipe is! Sure to please my family! Thanks for sharing at One Creative Weekend! This looks good. I don't like cauliflower but think I should probably give this a try. I'm looking for low carb recipes and this fits the bill. Thanks for linking this up at Think Tank Thursday. This sounds healthy and looks yummy! Thank you so much for sharing it at SHOW-licious Craft Showcase! Great way to get kids to eat their veggies! Thanks for sharing your recipe & ...@ DearCreatives.com Hope to see you again this week for the party. Have a great weekend ahead! By the way, thanks for telling me about my "followers" link not working! I had no idea! I got it fixed as well as the "captcha" thing. I really appreciate the help! Have a great weekend! This looks awesome! Thanks for sharing at the Crafty Cowgirl Funday Sunday - can't wait to see what you share next time! LOVED the name of this post! It totally cracked me up when I saw it last week at my link party @The Weekend re-Treat! Wish I had this recipe when my kids were little...pretty clever, Diana!! Thanks for sharing at Throwback Thursday!! 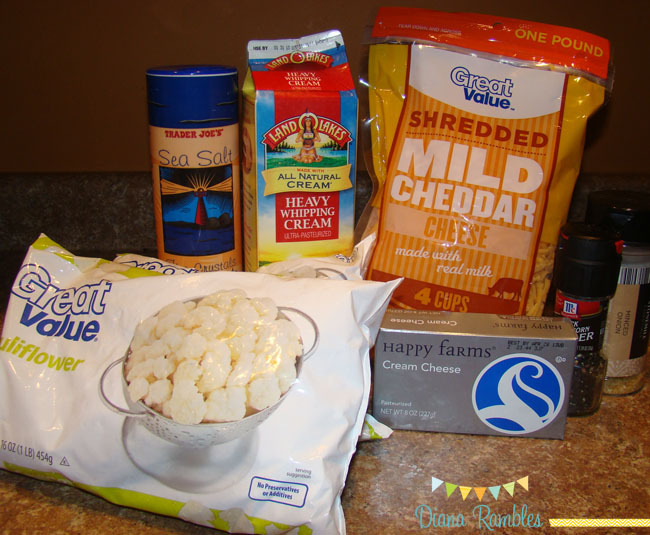 Thank you for linking up to Snickerdoodle Sunday! I will try this :) looks so yummy! Hi Diana- just saw this recipe on Freedom Fridays, and it's right up my alley! LOVE anything with cauliflower, especially when it's used instead of high carb ingredients. Thanks, pinning this now! I need to try this, Diana! I think my family would enjoy this :) Thanks so much for linking up to Freedom Fridays!